"Cancelled - Due to lack of interested persons the Trust Travel Trip to Eastleigh on Saturday has been cancelled." I guess that a 6am start at a cost of £35/£40 wasn't attractive. Let's hope a few exiles turn up. This despite the fact that they have improved this season and are apparently playing good football under manager Ian Evatt despite a small budget. Last Tuesday's 3-1 win at Wrexham was an outstanding result. Therefore this should on paper be a difficult game. I'll still predict either a narrow win or a draw. Forecast is for it to be windy again tomorrow, possibly improving by the start of the match. Every game is a difficult game and this will be no exception. Yes, conditions will be tricky. If we perform as we've done away at Aldershot, Salford & Chesterfield, we will win. I'd be happy with a one goal margin. But a draw wouldn't be too bad. I'm happy for Barrow to park the bus as Maidstone did and grind out a defeat. Barrow park the bus. Are you serious. They went to Wrexham and totaly out played them. So why the hell would they not try to do it v us. Can we move home games to away venues!!!! Well they did! Fortunately for them our front line was absolutely toothless, and who decided that Reda was MOTM? Stevie Wonder? Their No4 should've won that easily, he had McCallum in his pocket all afternoon! 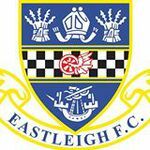 Eastleigh were rubbish today..
Their No 4 was our ex player, Jason Taylor who, when fit, played defensive midfield for us. He was immense for Barrow and must have been chuffed to return to the Silverlake and take all 3 points. Well deserved, Barrow. A game of two halves. The first playing against a very strong wind against a well organised and pacey Barrow side, bar the goal, which was poor on many levels, we did alright. The second playing with an almost gale force wind behind us was simply dreadful. There was no spark, no energy, no pace, no plan, nothing. In a half of 50 minutes, it took us 46 to mount a serious attack. Put bluntly Barrow wanted it more than we did; they were first to every second ball, and that is simply unforgiveable. our home form has become a major problem for us, today that performance, especially second half, was utterly unacceptable. I have never booed an Eastleigh team, and never would. Didn't hear the booing (made a quick departure at the end) - but if there was any, it was totally unjustified, given what's been achieved this season. We probably haven't seen the best of them at home, though. However, it was a very disappointing performance, I agree with michaelefc that Barrow looked like they wanted it more than we did. Obviously it was a game dominated by the wind - as said, with it, Barrow were very good, first to the tackle, passing it round well. Jason Taylor, whom I rated at Eastleigh (may have been in a minority there), did a superb job on McCallum to shut him out of the game. The goal was poor but their guy took it superbly. I was saying that only being one down at half time was a) flattering and b) meant that we could make a comeback with the wind behind us. Unfortunately after a decent start to the half we didn't put much pressure on Barrow (who didn't park the bus by any means, they just competed better than us, and given the wind, I'd expect the ball to be in their half rather than ours) and by the end they even had a couple of decent breaks and nearly extended the lead. 1) Hollands and Gobern are quite solid in midfield, but create very little. 2) Yeates playing behind the front two is a waste of our most creative player - he's far better coming in from either wing. 3) Williamson coming on as sub was fine, but we needed an extra forward badly given that McCallum was marked of it. 4) Why so few long shots on goal in the second half? We had a couple early on which went close, with the wind we could at least have got the keeper involved. Barrow were a good team - good enough for the playoffs apart from the bad start to the season - but we made it too easy for them. I think the MOTM award is for an Eastleigh player, so Taylor couldn't have got it (ex-Eastleigh player?). Giving it to Reda sounds like the lazy default option, but nobody stood out - at all. I think that when a team achieves a good set of results with their forwards and attacking midfield players having a significant effect on this then more teams will attempt to nullify their attacking threat with the knowledge that if they do this successfully they will have chances to score later in the game. I do not know whether parking the bus implies playing for a draw from the outset. I actually think there is a difference between playing for a draw as a minimum and playing for a draw. I was not at yesterday's game, but it seems from what people saying that Barrow were quicker to the 50-50 balls and for me that is often a key factor in a game of football and I think the wind would have been a significant factor yesterday.